The Harriers face the toughest game of this FA Cup run so far when they come up against the National Premier giant Chester FC. I say giant because we’re now classed as a minnow in this competition and have already had to go through two previous rounds to get this far. Time was when we were the giant coming into this round for our first game and now it’s come to this embarrassing situation that we find ourselves in. The two wins at Deeping and Newcastle Benfield couldn’t be called convincing by any stretch of the imagination and I fear this might be where we go out. We have to work hard to stop that though and tighten up both defensively and going forward. Hopefully with one game under his belt new defender James O’Connor should know more about his partners in crime and might be able to iron out the basic errors that we have seen at the back so far this a season. Up front we still seem to be a little shot shy with far too much build up play that eventually gets us no where and the ball coming back at us to put the defenders under pressure once again. A vicious circle but at the end of the day this is where we are and we have to make the best of it. For the game tomorrow we’ll still be without Lee Vaughan and Liam Truslove and there’s no sign of a return date for either of them. Add in the injuries to Dan Bradley and James Pearson since the Newcastle game and a new injury for Tyrone Williams and we could be a bit short on the subs bench. Ty took a kick to his eye at Bradford last Saturday but seems to have just bruising and not a fracture so he could be available for us. Chester come to us for the first time in two seasons but with them struggling near the bottom of the table they’re not looking forward to it. They recently appointed the former Harriers defender, Marcus Bignot, as their new manager following a run of poor results. He hasn’t had time to work any magic yet because his first few weeks in charge have had mixed results. His first game there provided a home win against Maidenhead but since then they have lost at home to Woking and drawn away at Tranmere Rovers. In between the last two they had their game at Eastleigh called off through a waterlogged pitch. They have three other former Harriers players in their ranks. 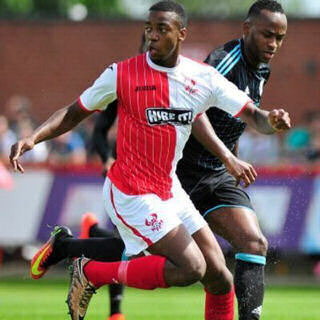 Lathaniel Rowe-Turner joined them from Torquay Utd during the close season while former loanee striker Harry White joined them from Solihull Moors towards the end of last season but hasn’t figured much due to injury. He may not be available tomorrow but is getting close to fitness once more. The other former Red is Tom Shaw who played for us in the 2010-11 season but for some reason didn’t want to stay at Aggborough and joined up with Cambridge Utd instead. As said earlier it won’t seem right us going into this game as the underdogs so we have to make sure we concentrate hard and make sure we come out on top. We’re overdue some success at this football club. Hall, Williams, Taylor, Digie, Horsfall, O’Connor, Pearson, Finch, Croasdale, Weeks, Austin, A Brown, Sonupè, Bradley, McQuilkin, N’Gwatala, Ironside, Wright. Lynch, Mitchell, Halls, Astles, Jones, Rowe-Turner, McCombe, Chapell, Dawson, James, Joyce, Shaw, Mahon, Turnbull, Waters, Akintunde, Bell, N Brown, Hannah, White.